Working mostly in porcelain, both on the wheel and hand building, I attempt to make pottery that is simple, honest, and unassuming. I strive to create work that is both appealing to the eye and touch, as well as functional. Even before I began creating pots of my own, I was drawn to Early American ceramics, American Art Pottery and Asian ware. I hope my work reflects that influence. 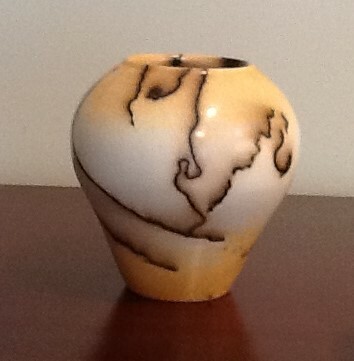 Recently, I�ve enjoyed exploring decorative low fire techniques, such as American Raku, saggar, and horse hair. Nothing pleases me more than to see one of my pots being used and enjoyed. After earning an undergraduate degree in philosophy at the University of Pittsburgh, Shelley began her study of pottery at Mudflat Studio in Cambridge. Since moving to the Cape she has worked with potters at the Falmouth Artist Guild, Castle Hill Center for the Arts in Truro, and Rhode Island School of Design. As a member of Cape Cod Potters, she�s taken many workshops with well-known potters. After working for twenty-three years at a �day job�, Shelley is finally able to pursue pottery full-time. She is currently studying with Denny Howard of Sagamore.